“How Did You Find This Place (When It Was Greener),” is a conglomerated layering of symbols, hidden materials, acrylic and house paints, dialogue, and many many miles and hours of Oberreich’s life. Oberreich’s piece visually brought the inanimate concept of “place” to life through the varying people that are inevitably tied to the viewer’s interpretation. For example, Tom Peck--a familiar face to the Center and member of the Board of Directors--realized that him and his family didn’t actually “find this place” but that the Harrison Center really found them. Summer intern, Megan Auffarth, felt sweet nostalgia and “dream-like feelings” from the painting. She found that the painting’s layers (seen and unseen) represent “a layering of experiences and memories that make her who she is.” Fittingly, Oberreich estimated that the painting has 20+ layers, some of which covered up mistakes, some were intentional, and some came to life on their own. Nikki Owens, the Center’s Events Coordinator, also noticed the doilies when in conjunction with the layer of “wallpaper” peeking through in their representation of home. To Nikki, the uncontainable movement of colors, the “Greener” section of the painting, and the filled-in “P” symbolized an abundant place that had been stitched back together. Intern Anne Green’s interpretation of place was a mixture of Indy and the Greek refugee camp where she was recently serving. 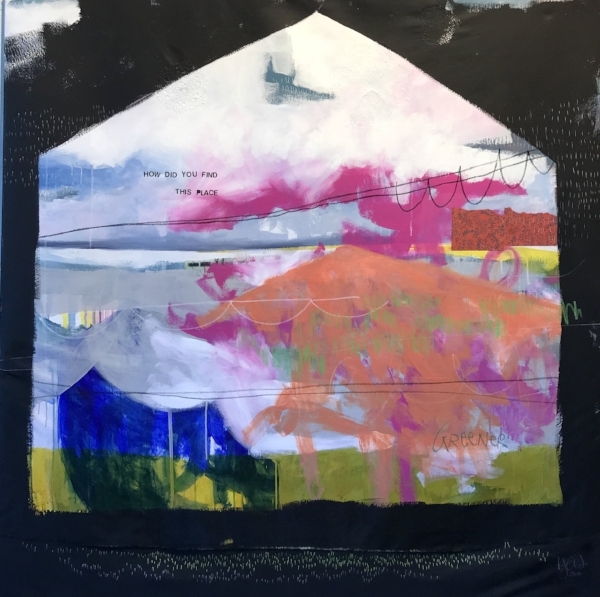 In the painting’s house of colors she saw white tents and clotheslines that were staples of how the refugees lived and inhabited place. These memories were sharply juxtaposed with the “Greener” that brought to mind her nostalgic, peaceful freedom of summer in Indy. The “Greener” section gave intern Tamar de la Paz the feeling of “relief,” and she couldn’t quite put her finger on why. Indy native and summer intern, Brant Wilson, explained that the title’s “(When It Was Greener)” made him reflect on how his neighborhood has changed since his childhood. When widening his perception of Indianapolis, he found that the Harrison Center was one of the only places that remained constant to him. While the painting’s text and “home” figure captivated many viewers, others focused on the colors, shapes, and the painting as a whole. Interns, Tamar and Amira Malcom, both viewed the framed shape not as a house but as a window. This interpretation opened up multiple meanings. If looking from the inside: the viewer’s surroundings are ominous and monotonous and the outside is beautiful and trying to get inside. This perspective creatively reminded Amira of Rapunzel. If looking from the outside: the frame depicts a dark unknown that’s interrupted by a home filled with vibrant movement and light— a happy place, if you will. She realized that “however you interpret this place to be, you know someone will have commentary on why it’s great or why it’s not,” which reinforces the subjectivity of place. For her, “How Did You Find This Place (When It Was Greener)” encapsulates her own journey of house becoming home and why she kept internally and literally returning to Indianapolis. If Oberreich could choose one thing that her audience would walk away with, it would be to “think of artwork in a more meaningful way-- there’s no right answer. It’s okay to say how you feel about art and it should have a reaction even if you couldn’t live with it everyday.” Even though everyone drew different meanings from this painting, they were still connected over the same source of inspiration. How did you find this place? What does place mean to you? Create some art or leave your musings in the comments below!